Triund is a popular excursion spot, which is approachable on foot. The beautiful spot standing at an altitude of 2,827 m above sea level is a 9 km trek from the centre of town. Trekking through the oaks and cedars is one of the popular vantage points, providing beautiful view of the Moon Peak and Indra Pass. Famous among trekkers and hikers, there is a snowline at Ilaka that is visited by adventurers. 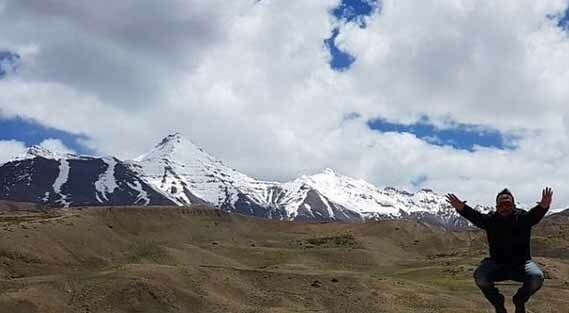 The nearest snowline of Himalayas through stony boulevard is one of the most exciting and popular activities to do in the destination. Bhagsu Waterfall, situated close to Bhagsunath Temple, is one of the beautiful streams in the destination. The waterfall has a cascade of 30 ft during monsoons. Decorated with slate graffiti, the mountain side of the fall is among the highlights of the tourist spot. Freshwater spring at the base of Dhauladhar range is considered holy. The water of the fall flows through the temple of Bhagsunath into the pools where devotees take a holy dip to get rid of their miseries. Bhagsu Waterfall is connected with Bhagsu Temple with a boulevard. A high point beyond the Dal Lake, Naddi village affords a magnificent view of Dhauladhar mountain range to the north and the vast expanse of lush Kangra valley to the south. Naddi is situated far away from the hustle and bustle of the Macleodganj market and provides complete peace of mind. It is surely the best place to spend some quality time amidst the heart of Dhauladhar mountains. Namgyal Monastery, a part of Tsuglag Khang, is a religious centre situated next to the residence of spiritual leader of Tibetan Government, Dalai Lama. Located in the midst of lush forests of pines, oaks and cedars, the monastery is designed in Tibetan style of architecture. The sacred building is overlooked by Dhauladhar ranges, which comprises a Tibetan museum, a cafeteria, a book shop and a library. Beautifully decorated prayer wheels and Buddhist shrines are the highlight of the monastery. Mata Kunal Pathri is one of the revered sites in vicinity of Dharamshala. The abode of local Goddess, which is surrounded by dense tea gardens, is frequented by tourists and devotees alike. Besides, temple complex offer a beautiful view of Dhauladhar range and low lying lawns. The rock temple is located near Kotwali Bazaar of Dharamshala, which is well connected with McLeodganj. The temple was consecrated by regional tribes amidst the town centre centuries ago. Dip Tse-Chok Ling Gompa is one of the most frequented spots of McLeodganj. The religious monument is constructed on a steep hillside in the shadow of Dhauladhars. There is a beautiful figurine at the Gompa. The monument can be reached by heading on a trail from Dalai Lama’s temple complex. Dharamkot is a small village at a distance of 3 km from the centre of town, enveloped within tall pines and rhododendron forests. There are various renowned spiritual centres in the village, which include Mountaineering Institute and Tushita Research Centre. The hamlet is also referred to as Tibetan Children’s Village due to the presence of school for Tibetan students. Among other popular tourist attractions in close proximity are Galu Devi and Galu Waterfall. Tsuglag Khang is among the world renowned religious centres, which is also identified as Dalai Lama’s temple complex. The complex in vicinity from bus station of the town is thronged by Buddhist pilgrims throughout the year. Namgyal Monastery, Nechung Monastery and the main temple are the highlights of Tsuglag Khang. The monastery deals with training of monks for rituals associated with holy shrine, whereas the temple is a chief place of worship. A beautifully decorated statue of Lord Buddha along with beautiful statues of Chenrezig and Guru Rinpoche are housed in the temple. Besides, chorten covered in thousands of prayer flags also draw attention of pilgrims and tourists. Moreover, Dalai Lama’s residence and Central Tibetan Administration are situated in the complex. Group of monks building an intricate sand mandala, practising debating techniques, meditating near chorten are some of the common sites to witness in complex. Along with paying homage at the holy shrine and exploring monastery, tourists can have an insight to Tibetan culture while visiting museum and library in the complex. Tushita Meditation Centre is one of the famous spiritual centres in the region to study and practice Buddhism. The centre imparts courses in Tibetan Mahayana tradition in the beautiful Dharamkot village of McLeodganj. This centre was established by Lama Thubten Yeshe in 1972, a spiritual preacher of Tibetan Buddhist tradition. Lama Zopa Rinpoche, a disciple of Lama Thubten Yeshe, manages the meditation centre of Tushita and Foundation for the Preservation of the Mahayana Tradition (FPMT). The centre provides peaceful environment for mediation and learning Buddhism. Keen learners can enrol themselves in intermediate level courses along with advanced courses.